Visit the Doges Palace, and you will pass through a maze of rooms and hallways. A landmark in the Venetian history... Children are thrilled by the mysterious labyrinth of narrow passageways through the palace’s prisons. The entrance ticket is inclusive the other Museums around the st. Mark’s Square. A ticket is valid for the Doges Palace (Palazzo Ducale), Museo Correr, Museo Archeologico Nazionale and the Monumental Rooms of the Biblioteca Nazionale Marciana. You can pay directly with your credit card. You will receive the tickets immediately to use them on your mobile phone or print it out. If you book it, you can use it instantly on your smart phone! Therefore, save the hour's waiting time to get into this museum by booking the tickets here. And see which tickets are still available. Why not join the Secret Itineraries Tour? Tickets are also EUR 20,00. It is a guided tour of the beautiful chambers and the scary prison where the famous 'Casanova' was locked up. For more info or other unique itineraries, you can visit the ticket desk or the Palazzo Ducale website. This ticket fee is inclusive a visit to the museum itself (without a guide). The entrance of the palace is on the side of the water. From the San Marco square you walk under the gallery towards the water. And then turn left. 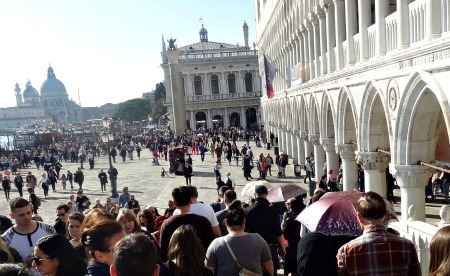 Beware, it can be jam-packed here with a long line (just like at the entrance to the Basilica of San Marco). Here's a picture that shows the crowds at the door. Why you have to visit the Doges Palace in Venice? The official residence of the 120 doges who ruled Venice from 697 AD to 1797 AD. Walk through the Great Council Chamber (Sala del Maggior Consiglio), the impressive room of the Senate members (Sala del Senato) and then take a coffee break in the palace’s former stables. The doge was the chief magistrate and leader of Venice. Doges of Venice were elected for life by the city-state's aristocracy. Commonly, the selected Doge was the elder in the city. Be impressed by the architecture and experience the beautiful art. The artists; such as Titian, Tintoretto and Bellini worked together to embellish the palace with paintings and sculptures. For example the enormous marble-clad façade. All the way through the palace you will get surprised in one miracle after another. Luckily, there are labels at the chambers with explanatory panels in Engels. So a guide isn't essential. Follow the red arrows. When you take the Secret Itineraries Tour, you will visit the chambers. Very scared, but, I recommend! The rooms where thy tortured prisoners. 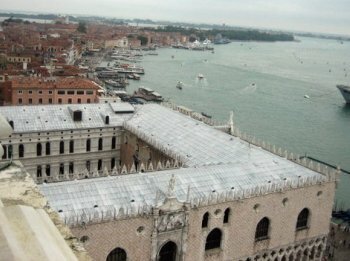 This page is about the Doge's Palace in Venice Italy. A must visit as you can read. Please explore my site more about Venice. 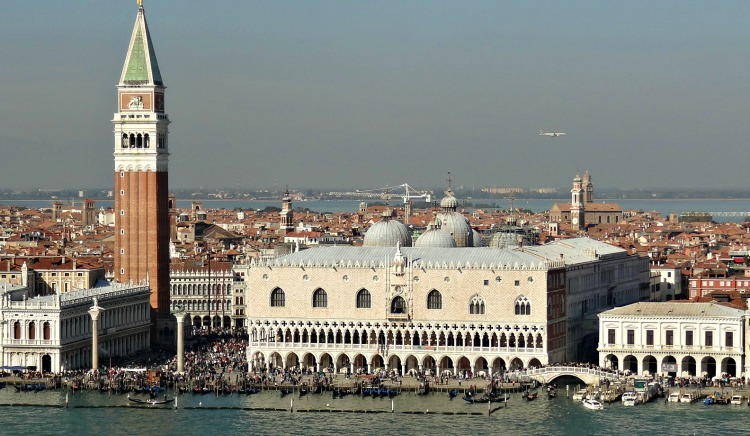 Return from 'Doges Palace' to 'Top 15 Venice Italy Attractions' and read more about all the beautiful sights in Venice. It will surprise you how good prepared you can be by reading this site.